red abalone shells for sale, and natural rainbow ruff back abalone shells, from 4 inches up to 8 inches, hand picked and photographed for people wanting to see exactly what they are buying. These beautiful red abalone and rainbow abalone are priced slightly above wholesale. 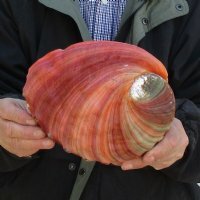 The red abalone is the largest species of abalone in the world and the most common abalone found in Northern California. It is one of the species farmed on a large scale in California. All of these abalone are beautiful commercial grade quality. None are perfect, specimen grade. You are buying the abalone shells pictured.